Agropolis International is involved in the Medina project 'Promotion of sustainable food systems in the Mediterranean' funded by the French National Research Agency (ANR), in the framework of the TRANSMED program (Transdisciplinary studies on the future of the Mediterranean). Agropolis International brings support for the project coordination and to the spread and sharing of the results to various stakeholders. Food security is based on three pillars: quantity, quality and culture respectful the right to food. Food and nutrition security must ensure the good coverage of nutritional requirements for health maintenance and disease prevention (obesity, diabetes, cardiovascular disease). The prevalence of such diet-related diseases is high and increasing in the Mediterranean basin. In an area where natural resources already suffer from climate and population pressures, the agro-food systems more than ever have to deal with the need for quality. Based on several studies, especially the ‘Seven Countries Study’, the Mediterranean diet became a model of healthy diet to prevent coronary heart diseases. However, although many Mediterranean products are available, their share in the population’s diet has impressively dropped during the last decades. A good coverage of nutrient requirements is based on foods with a high nutritional density that can be attained by a higher consumption of diverse Mediterranean traditional foods. In the current context of widespread consumption of energy-dense/nutrient-poor foods, a valorization of the nutritional qualities of Mediterranean foods becomes an important issue for the agro-food system. Besides nutritional quality, foods include many other dimensions such as hedonism, convenience, safety, plus environmental and social requirements, and all are important to integrate in order to achieve sustainable food systems capable of sustaining food security and health. The Medina project addresses the following questions: how to ensure quantitative and qualitative food security in the Mediterranean countries? What would be the impacts on the organization of food chains, from the distribution up to the production sector? How to keep a place for locally produced traditional Mediterranean foods in a context of strong urbanization and globalization of the agro-food trade? The Medina project is based on the idea that the food supply is a major determinant of the consumption behaviours. From there, the objective of the project is to build scenarios and propose solutions to maximise agro-food chains’ contribution to human health and nutrition in a sustainable way. 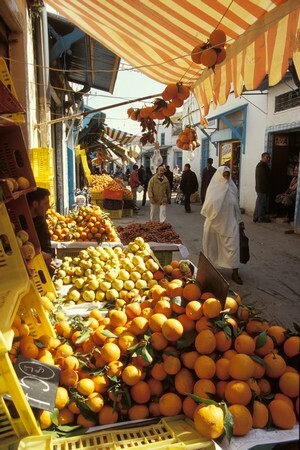 The first originality of Medina project is the “fork to farm” approach, based on existing data from surveys obtained in three contrasted areas in terms of food systems and consumption behaviours: South-East of France (the Languedoc-Roussillon and Provence-Alpes-Côte d’Azur regions), the ‘Greater Tunis’ metropolis urban zone and the ‘Sidi Bouzid’ rural area in central Tunisia. Other data will be generated on foods (nutritional quality, prices, carbon and water footprints) and on food chain systems (socio-economic data). The second originality is the use of a combination of nutritional and economic modelling tools to integrate collected data and generate scenarios. INAT(Institut National Agronomique de Tunisie). The project results will be regularly disseminated to target groups: international scientific community; economic stakeholders along the food chains; agriculture, food and health policy and decision makers; the general public; higher education institutes. October 28 - november 02, 2013: Field trip to Tunisia: some of the researchers involved in the Medina project met in Tunis with the local partners and went for a visit to Sidi Bouzid, in order to define the strategy and timing for field data collection.